Renato Moicano will not be facing Chad Mendes after all, as reports have broken that he has instead drawn #8 ranked Mirsad Bektic for UFC 231. Sources close to the bout have confirmed this report to MMA News. 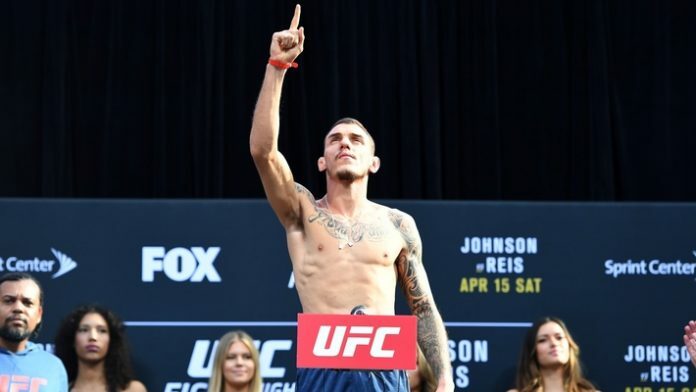 With only one professional loss in his MMA career that came at the hands of current #1 contender Brian Ortega, Renato Moicano has been a quiet storm in the featherweight division with a 5-1 UFC record and 13-1-1 overall MMA record. Moicano holds victories over ranked fighters Jeremy Stephens, Calvin Kattar (then ranked #14), and Cub Swanson, and will look to make it three wins in a row when he squares off against Mirsad Bektic. Mirsad Bektic also has 13 wins and only 1 loss, and he, too, enters the fight on a two-fight winning streak. Bektic most recently defeated Ricardo Lamas via split decision at UFC 225. #4 ranked Renato Moicano will be the highest ranked opponent Bektic has ever faced inside the Octagon. This bout was originally booked over three years ago for UFC Fight Night: Condit vs. Alves, but Moicano was forced to withdraw from the bout due to injury. The timing has worked out in the favor of Bektic who stands to gain a major boost in the rankings should he score the victory this December. UFC 231 takes place from the Scotiabank Arena in Toronto, Canada on December 8th, 2018. The card will be headlined by Max Holloway defending his featherweight championship against Brian Ortega. Should something happen to one of the two headliners, it would seem Renato Moicano would be the first choice to step in as a short-notice replacement. The card’s co-main event will feature the crowning a new women’s flyweight champion when Valentina Shevchenko takes on Joanna Jedrzejczyk. Who do you think will win this featherweight bout? Renato Moicano or Mirsad Bektic?